Belmarmi has been creating beautiful bathrooms environments for the most discerning clientele for more than 20 years. Our clients know we partner with only the best and brightest suppliers and vendors. Our new partnership with Vanity Flair continues this tradition. Vanity Flair, a Furniture Guild company specializing in bathroom furniture pieces, offers high-quality, custom furniture as vanity pieces. Ranging in style from traditional to modern, each bench made piece is handcrafted using the best of old world techniques and new technology. 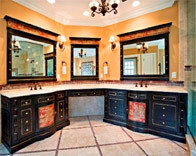 Vanity Flair custom made vanities are available in a extensive variety of designs and styles, ranging from casual cottage pieces to Classical European design with exquisite details and hand-painted ornament. There are more than 40 finishes ranging from traditional paints and stains, to exotic veneers, to textured gesso and gold leaf, as well as panels upholstered in fabric. 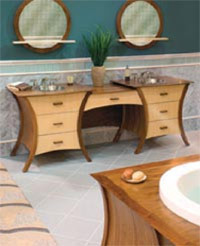 Through Belmarmi, Vanity Flair will tailor a vanity in any style, to fit any space, with any finish. Their motto is “Impossible Solutions are our Specialty”. Like Belmarmi, Vanity Flair understands the importance of developing a business model which encourages customization and the importance of working hand-in-hand with clients to achieve a desired result. Although we are excited about all the new products we are showcasing at Belmarmi, we are really excited about Bear Creek Glass. 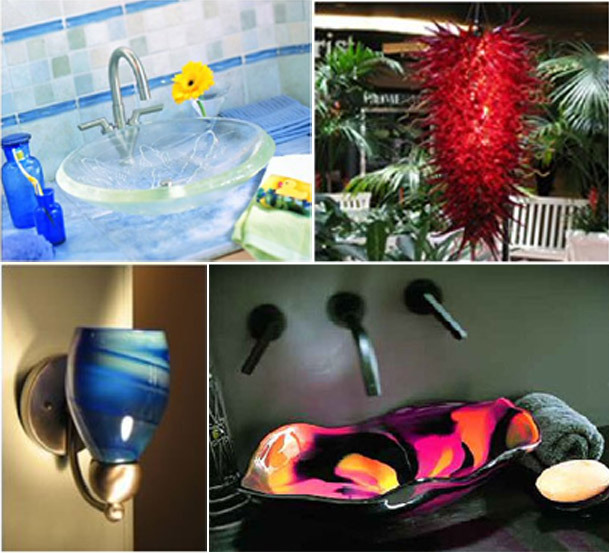 The artisans of Bear Creek Glass studio create unique, functional art in the form of basin sinks, matching bath accessories, chandeliers, pendants and sconces. Each Bear Creek piece is a work of art hand-crafted using recycled glass in every product. The basin sink lines include Classic, Splash, Ocean and Fusion. 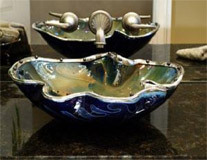 The Classic Basin Line is tasteful and elegant, offering sizes from 13 to 17 inches in diameter and 4 to 6 inches deep. The Splash Basin Line imitates the fluid qualities of water with gently curving sides, available in sizes from 15 to 19 inches in diameter and 4 to 6 inches deep. The Ocean line is a free form, organic bowl, destined to become the focal point of any installation, available in sizes from 16 to 19 inches in diameter and from 4 to 6 inches deep. The Fusion line has crisp, geometric lines with a sleek profile, perfect for both Modern and Traditional décor, available in sizes from 16 to 18 inches in diameter and from 4 to 4 ¼ inches deep.